"We will not have another Atlantis. This will be Freedom's Star!" " . . . One of the gravest errors on the Path of many who are reaching for the Light, who are sincere, who are earnest, who have come to the Feet of the Masters and said 'I am ready to learn' - one of the gravest errors that must be corrected - is the attention, beloved ones, on any of the lesser planes. I cannot stress any more emphatically than has already been delivered to you through My previous Words this eve, of the absolute travesty that is afforded to the lifestream of the one who would dabble in the psychic plane. "The psychic plane will keep you from making your Ascension, not only in this lifetime if you are not careful, but many lifetimes to come. There are traps of which you are not aware. We have not spelled out all of the traps, because in so doing there is a certain fascination toward the examination of those traps; and it is Our Desire that there be enough Violet Flame go forward that will keep you from harm's way. "These Messengers will sound the Call, the Tone of Purity. They will sound the Tone that will keep you galvanized to the Highest Vibration - if you will but listen. It remains to be seen if you will even listen to the Call and hear the Tone. For it is Our understanding that there are those who would still find themselves the authority in those areas, and choose to ignore My Warning and the warning of the Messengers. "I speak sternly on this matter because the fabric of the foundation of The Temple of The Presence must be firm. As We have said, as Master Morya has already told you, there must not be a tear or a rent in the garment. The psychic plane has no place in an Ascended Master Activity. "This was the reason, beloved hearts, that I, with beloved Godfre and Lotus, was able to accomplish such a Great Work in the 1930's. The psychic was not allowed. It was not spoken of or practiced in any of the corners of the Activity, away from the ears of the Messengers. I tell you, beloved hearts, it is necessary to speak on this, not only for the moment and the time, but for future times because the record must be made clear. . . . "
" . . . Know that this is a very serious business. It is not something to be trifled with. I do not know how to speak any more clearly or plainly on this subject, but I hope that My Record will stand - that those here and those who will hear My Words in the future will repeat Them, and continue to repeat Them, until the clarion call goes forward and you do shepherd those lost souls who are dabbling in the psychic plane out of harm's way. "I, Saint Germain, not only come with a warning this night, but I come with a special Dispensation from the Karmic Board. For those who are willing to enter in, for those who are at any point of the globe, - ready to receive this Dispensation, from My Heart and the Heart of the Karmic Board, - there has been allowed and afforded the Opportunity of the Release of enough of the Violet Flame to transmute those records of psychic activity of those lifestreams who are willing to cease and desist this activity and never to return again to such practices. "There is the Opportunity of those lifestreams to go forward who are truly earnest and intent on the Love of God - to have those vortices of negative energy sealed from their lifestream. The requirement would be that they never open the door again, and that they guard well any peeping and mutterings that might come forward from their mouth that would tie them in any manner whatsoever to the psychic plane. . . . "
" . . . For truly this Dispensation comes forth from My Heart as a Gift of God Love - for truly the Violet Flame is Pure God Love reaching through the veil and transmuting all human substance - cause, effect, record, and memory - when it is allowed to go into the Flame. 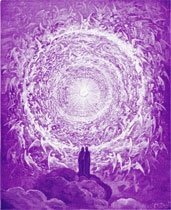 For those individuals who are ready to release this into the Violet Flame, there will be a lifting of such a weight, an unburdening, that they will feel as though they have been born anew and are as a babe - untouched by any karma. This is how grave the weight of that density of the psychic / astral plane is upon their being. Many have carried this weight for so long, and for so many embodiments, they know not what the true Freedom of the liberation from that realm can bring. "I tell you the Ascended Master students are ready to stand in Freedom's Flame, and ready to proclaim It throughout the Earth. We will not have another Atlantis. This will be Freedom's Star! And We, the Ascended Masters, have chosen to make this Activity the focal point for the Release of that Light and Purity's Ray to enter into the Earth again. There are those individuals who have vowed at Inner Levels to be the focal points of this Light as well. They will be part of this Activity, and they will carry forward this Activity into all points of the globe. "We are excited about the Opportunity, and I tell you, beloved ones, this Dispensation of the Violet Flame would not have come forward were there not individuals sincere and dedicated with the full commitment of their heart to make it so. It is an Opportunity, not only for this Activity, but also for all of the Lightbearers of the world. Therefore, I proclaim this day as a Day of Liberation from the psychic plane. Will you assist in this Work? (audience responds: Yes!) Then it shall be so, and We will carry it forward. And I will continue to Release this Violet Flame as long as necessary each time one is brought in contact with this Dispensation. 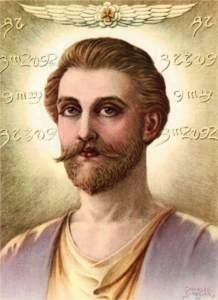 For I, Saint Germain, stand for the Freedom of each of these lifestreams. I look forward to their Day in the Sun, and I look forward to your Day of Victory in the Ascension in the Light! 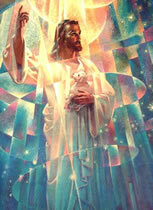 "I thank you, and I seal you now in the Fullness of the Love of My Heart, and I say: Hear O Universe, We are Grateful! Thank you!" Saint Germain, January 2, 1999 The Temple of The Presence®, Copyright © 1998 The Temple of The Presence,Inc.